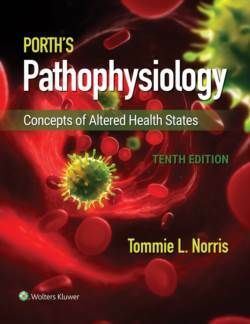 The 10th edition of Porth’s Pathophysiology: Concepts of Altered Health States continues a legacy of excellence by providing comprehensive, nursing-focused coverage designed to help grasp both the physical and psychological aspects of altered health. The book’s unique emphasis on “concepts" of altered health states, as opposed to factual descriptions of diseases and disorders, helps students grasp both the physical and psychological aspects of altered health. Unit-Opening Case Studies , which are revisited in one or more chapters in the unit, bring pathophysiology to life and equip you for success in clinical practice. NEW! Pediatric Considerations and Geriatric Considerations boxes in each chapter specify how the chapter content applies to these two special populations. NEW! Concept Mastery Alerts explain topics that students can find confusing.